When a zombie eats breakfast, it puts a napkin in its lap, pours some fresh squeezed orange juice into a tiny glass, cracks open a human head, and then (pinky out) proceeds to delicately scoop out the brains with a small spoon. And then the zombie eats the brains as it reads the daily paper and begins a new day. Well, we’re tired of zombies always eating our brains as part of a balanced breakfast. Now, it’s our turn to eat their brains, with this Zombie Bowl! The Zombie Bowl is made to look like (most of) the head of a zombie. But there’s no top, so you can add all the foodstuffs you want. We like using it to eat things that look like brains. Soggy shredded wheat is good. Spaghetti with tomato sauce works well. Beef stew sort of looks like throw up, so that’s acceptable. 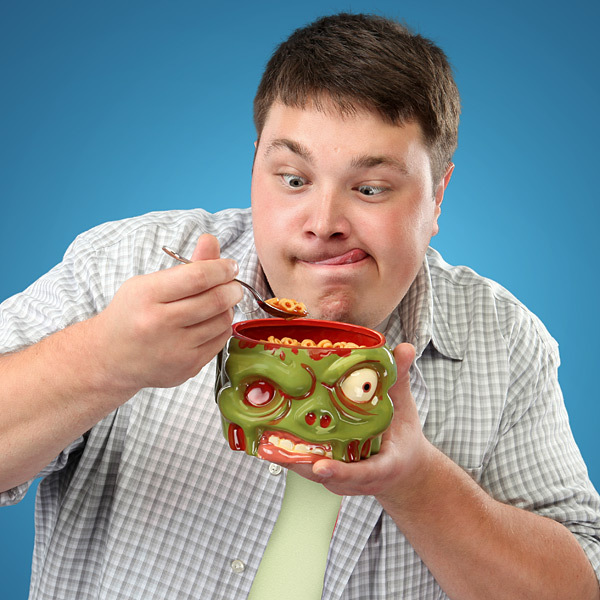 Eating gross-looking things out of your Zombie Bowl is a great way to elicit stares, laughs, and fear in your home or office. Make us proud: send us action shots of the grossest things you eat out of your Zombie Bowl!